.........didn't just fall there. He had parents and ....children. Guess when? In the 1950's and 60's. This Barbet* does look like several today, doesn't he?! Line 1 of the Barbet: Le Houelleur. Back to the 1920's and even 1886...Pilote! Do you think he believed me? not sure. "why did she do this to me? She was mean to me..."
Okay, I know his 5th birthday will be in 132 days, but it will be a grand moment for some, so I thought I would use that excuse for cutting him down to his birthday suit. You know I don't like to show Barbets in their birthday suit, but the one coming up will be a special one. So, what the heck. April 20th will be a new day for Guyguy and his 2 bothers in Sweden! I will post under "grooming", how we did it and why I scissored it. 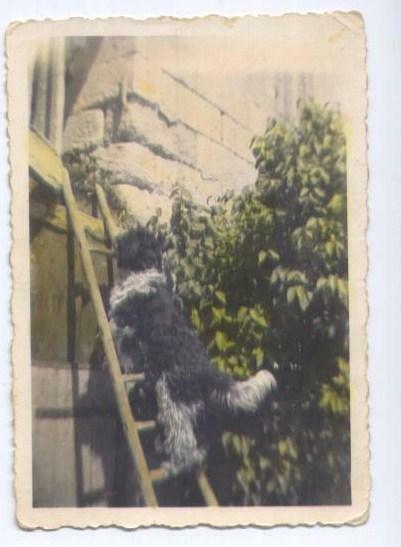 Ermengarda, aka Coccolina*.Elite B 5/6 on the French Société Centrale Canine selection grid. Mom to 4 Barbets quoted 3/6 on the SCC selection grid. Mom to several dogs who are Guide dogs for the blind. I can't ask for much more! 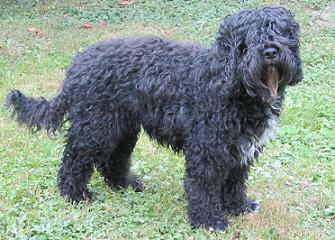 Coat: curly and easy to groom with the characteristic white/gray hairs throughout her body that comes from her ancestors. Characteristic white paw and beard. Let's hope her last litter in 2011 is as nice as the others! She certainly has worked very hard for our beloved breed, my Coccolina. *Her name comes from the Italian:coccolare with a double c, which means to cajole, to cherish. It fits her so well. She is a gem...to cherish! Those of you who know her, "have I missed anything?" I think at some point, people need to make decisions and every so often the time comes when you have no choice. Another person this morning, told me there was not much info on the Barbet in French and France being the home country and me being a Barbet historian, that was the straw.......It's high time to turn over a new leaf. My history( Barbet French National Treasure) site will turn back into French. The documents are French and the book I have been working on is also in French. The information on The Authentic Barbet we promote is naturally in French and has been.It is the langage de l'amour du Barbet...! This site will continue to be in English, so not to worry! It's 28 minutes long, but the Barbet is in the last 10 mns. 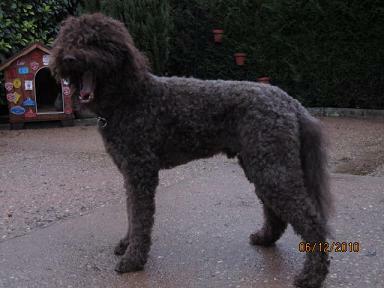 And yes, they did say that the poodle was the ancestor of the Barbet......which was/is a mistake.The Barbet is the ancestor to many breeds and one of these days, as I said, people will stop using that "cliché"! I am having to refurbish it. Many posts have been taken down until I have time to consolidate my information. As most of you know, all my research is destined for a book and there's still so much information out that that like anything else...I didn't know 2 years ago what I know now and it is all coming together. Please bear with me.